I spent my last weekend in Bear Mountain State Park and find it would be a great location to make documentary on sports or nature. The park features a large play field, lake and river fishing access. Many people go there for hiking, biking and cross-country ski trails. Moreover, from its website, an outdoor rink will open to ice skaters from late October through mid-March. From top of the mountain, we can even see the skyline of Manhattan. Following are the photos taken on last Saturday. Through my temporary expert class research, I became somewhat familiar and extremely intrigued by shipwrecks. Other than their historical value, most shipwrecks end up as accidental ecosystems for ocean floor species, including the critically endangered oysters. One of the obvious things I had to research is whether there exists a publically accessible shipwreck site in NYC. I came across information about a lesser known ship graveyard that exists in Staten Island. All my research about it indicated that the access to it is quite limited; there is a thicket around it that allows only for spectators to see the ghostly ships from afar. However, there’ have been some extremely great efforts to document the graveyard to amazing results, including haunting photos as part of a photography series by Miru Kim. I feel that using drones, it would be really interesting to “explore” the ship graveyard, and possibly allow many other interested individuals to experience the eeriness of some of the ships that go back as far as WWII. An abandoned sanitarium (and one-time residence of “Typhoid Mary”) in New York City. I think it’s illegal to enter the property and possibly only accessible by kayak but has always been a place I wanted to explore and is full of fun mysteries to see. Another abandoned island zone, also only accessible by boat and private. Site of Bannerman’s Castle which was an armament warehouse. Before I forget, here is a recent article with photographs regarding the long-lasting effects of Sandy on Staten Island which I’ve read some of us are interested in covering. Anyway, I’m interested in bicycle safety in Manhattan, which is a hot topic right now — this summer two pedestrians were killed after being hit by bicyclists in Central Park. I think this is a particularly appropriate story to cover in this class as an aerial view could possibly show the drastic speed differences between bicyclists and pedestrians in close proximity in a more striking way than a ground-level shot could. In my opinion, Central Park would be a particularly relevant place to film since so many tourists mosey around the area, as well as New Yorkers out for a leisurely escape. However, I see bicyclists maneuvering unsafely all over Manhattan: running red lights, going the wrong way down streets, riding through people-filled crosswalks and sidewalks etc. Again I think an aerial view could be extremely effective in showing just how dangerous some bicyclists can be. I’m looking forward to hashing out this idea in class today if anyone else thinks it’s a topic worth covering. I have always been fascinated by how elegant the design of the Brooklyn Bridge is. Despite being one of NYC’s most popular attractions, it is a bridge with a huge cultural and historical impact. I think it would be really cool to make a short documentary on it. The documentary would focus on the history behind the Brooklyn Bridge (the history behind its amazing design, why it used to represent ‘innovation’ back when it was built, and how it has now changed to represent NYC’s past and where New Yorkers came from); also it would focus on the cultural impact that it has had over the years (how it immediately became a cultural sensation, and how/why it has become one of New York’s most visited sights). The reason I think that a documentary like that suits well with this class, is because drones can offer us unique perspectives of the bridge (angles that otherwise one can only take with helicopters). I checked the map of where drones are allowed, and it seems that it is perfectly legal to fly drones near the Brooklyn Bridge (obviously we would not go on top of cars and people, but would only fly on the side of the bridge above the water). The only risk involved with a documentary like this is that we would have to fly the drone above water (which is kind risky in case anything goes wrong with the drone). 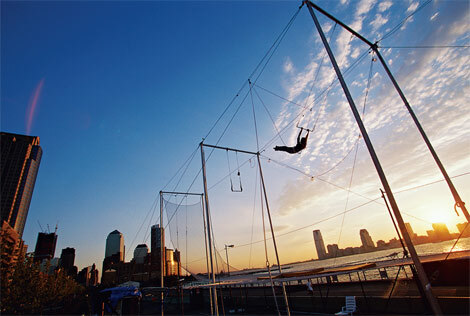 TSNY, the trapeze school on the roof of Chelsea Piers, could be a good location for filming circus aerials. The President of TSNY, Jonathan, is an interesting artist and person and more importantly, someone I could probably get in touch with (he’s a friend of friends). I think Trapeze is visually pretty great, especially if we show skilled people and it would probably be suited to the flying camera angle. -Finding a story worth covering, whether it centers on the location and sports complex, people learning to ‘fly’ or the community of instructors involved in the success of that unusual business. -Negotiating the private property aspect of it. The potential for flying at night (they have lights) might help us avoid attention. I love this area. I think the proximity to the city clashes with it’s geography and beachtown feel. There are interesting abandoned spaces and large container ships on the horizon. It would probably take some digging to find a story here but who knows: maybe people are doing polar bear swims right now. There are some interesting house-dwellings in the city and they immediately lead one to imagine life on the water here in the city. 72nd st boat basin has a rule that if you haul your boat out to fix it you will lose your place and have to join the wait-list which leads to decrepit boats resting on the floor of the hudson that serve as fairly affordable housing for the mysterious residents. The Gowanus canal and Newtown Creek are also sites of boat-dwellings. The idea of exploring the oceans sounds very interesting to me. Mainly because of the fact they cover 2/3rds of the planet and they are huge bodies about which we know very little. One idea was to use an aquatic drone but it can also be done using a weather balloon or a DJI. Space and seeing the planet from a very high altitude. About the height of 10-15km up to about 25 km. 100,00 ft. Using weather balloon. Use a telescopic drone to film the milky way. From a high altitude. When I was playing racing video games a good decade back, the thing that amused me was to look at replays of my drive in dramatic camera angles. I always wondered if that would ever become a reality – camera going around the car as it moves. More recently, the spidercam has been used in giving dynamic and interesting views in sporting events like football, rugby, cricket etc. This works perfectly well when the size of the playing field is defined and restricted. What about sporting events that are not? This got me thinking how drones could help cover events that happen over longer distances – like a marathon, ultra marathon or a cycling tour. Presently, these events are covered by helicopters or motorcycles riding along to capture the action. This causes noise and air pollution distracting the runners/cyclists from focusing on their goals, not to mention the cost of flying a helicopter over the course. Drones could really take advantage of putting the camera in the air, enhancing viewers’ experience and giving them a good perspective. There could be solar powered drones flying along runners, that would cover the environment and topography in a really dynamic way. So, my idea – No, I am not planning to shoot the New York City marathon this weekend. I was thinking more like a demo video on how an ultra or a trail run could be covered with drones by shooting a simple 5 mile (trail) run or a race among 3-4 people. Everyone could be given heart rate monitors and GPS watches so that the info could be presented real-time as an overlay when focusing on them. Flying out (zooming out) would really put things in perspective and give an overall feel of the environment. It could even be a single person running in the park and the footage of his run could be presented in an interesting way. Here are some basic sketches of what I had in mind. Drone feature: It would be great to define a point of interest on a map so that the camera on the flying drone would always face in that direction irrespective of which direction it is facing. Taking this to another level, what if the point of interest is dynamic – like a moving person. It should technically be possible because, the POI could send GPS locations constantly and the drone would be aware of its own position and height in space. It should be possible to calculate roughly the angle in which the camera should face to cover the point of interest. Have I mentioned my obsession with abandoned buildings? Though my interest in Lynnewood is not completely morbid, it has been touched by tragedy. Peter Widener’s eldest son and grandson died on the Titanic. After Peter Widener died in 1915, the estate was used for training military dogs during World War II. Since then it has been passed from one church to another, yet none of these churches have managed to do anything with the impressive estate and it remains vacant. As of this past July, the property is on the market for $20,000,000. Though it’s suffered over the years from neglect, the estate is still beautiful, if fairly eerie, and was dubbed by Widener’s grandson to be “the last of the American Versailles.” I’m curious about how a place that was such a symbol of its era could fall into disrepair, and what it would look like if you could see into its windows (there’s an iron fence around the property, but it doesn’t stop some people from going to investigate). It sounds like there may still be furniture inside. The area in general should be okay to fly in, but I don’t know how it works with these old abandoned properties that don’t really belong to anyone anymore. There is also the St. Nicholas Coal Breaker in Pennsylvania as well that has an interesting history of visitors rearranging its insides, and then Long Island’s Kings Park Psychiatric Center which was, during the time it was operating, known for being on the cutting edge of psychiatric treatment. I am, of course, talking about lobotomies and the like.